Headstand: An asana in which you balance on your elbows, arms, and head. Known as the “King of the Asanas” because of its remarkable benefits, the Headstand is the first of the 12 asanas and is excellent for improving concentration, increasing memory, and transforming libido into powerful life force. In addition, people who practice Sirsasana on a regular basis tend to have slower rates of respiration and heart rate. To the surprise of many first-time students, this pose does not require any special strength or flexibility; all it takes is practice and going step-by-step. Even so, you may wish to begin by undertaking the Dolphin, progressing to the full Headstand over time. Objective: To relax and invigorate your entire body. • Have high or low blood pressure. • Suffer from glaucoma or have had recent eye surgery. • Have had a recent neck injury. Lean forwards, clasping each hand around the opposite elbow and place your arms about 8 inches away from your knees on the floor in front of you. Keep the buttocks on the heels. Keeping your elbows where they are, move your hands forward and interlock your fingers. This creates a firm triangular base with your hands and elbows, with equal weight on all three points of the triangle. Mentally affirm “my arms are my legs”. Bend over and place the topmost part of your head on the floor, firmly pressing the tripod of elbows and hands against the mat and with your hands firmly supporting the back of your head. Do not move the elbows. Keep the neck straight. Without moving the head or elbows, straighten the knees and lift the hips. The weight is kept on the elbows. Make sure that the elbows are stationary. Walk the feet forward, trying to keep the knees straight. As the feet come closer to the head, feel the back straightening. Keep walking until the hips are directly over the head. Keep pressing the weight on the supporting tripod you have made with your arms. Carefully lift the feet off the ground, bending the knees to the chest. This requires using the abdominal and lumbar muscles. Bring the feet up to the buttocks and try to hold this position. Straighten the back. Do not try to ‘jump’ or ‘kick up’ and do not try to straighten your legs as you could easily lose balance doing this and fall straight on your back. Instead, slowly tilt your pelvis backwards until you find the point of balance in your lower back. In this position, the weight of your bent legs is balanced by the weight of your hips and buttocks. Keep as much support as possible on your forearms and hands. Breathe rhythmically and hold this half headstand for up to one minute. Keeping the knees bent and together, slowly straighten the hips until the bent knees are pointing towards the ceiling. Feel as though the hips are a hinge that is slowly opening. Do not be in a hurry. Keep the concentration on the elbows and make sure they do not lift off the ground. Also focus on the balance in your lower back, so that your body neither topples forwards nor backwards. Slowly straighten the knees, bringing the feet up. Remember to keep the weight on the elbows and breathe deeply. Start with 5 seconds, gradually increasing the time to fifteen minutes. Optimum time is five to ten minutes on a daily basis. 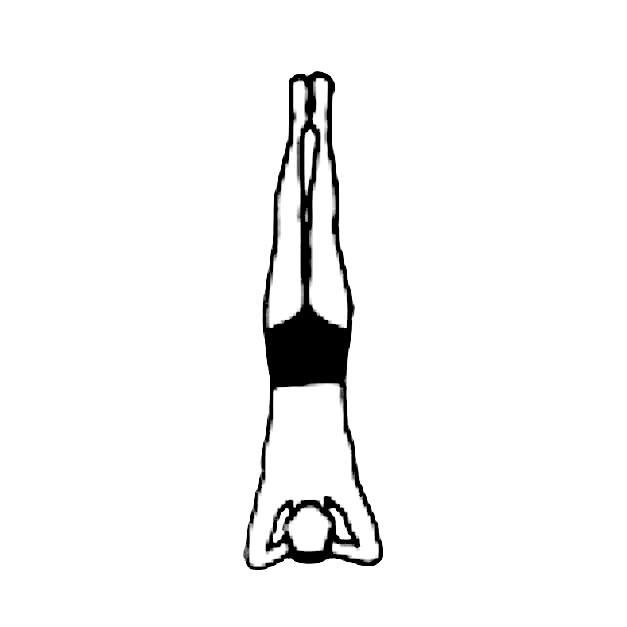 While in the headstand make the breath smooth and rhythmical. The weight remains on the elbows. Gently leave this asana as carefully as you entered it. • Bend your knees and lower them. • Straighten your legs. Bring your feet to the ground, and then lower your knees. • Lower your body so that your buttocks rest on your heels as in the Child’s Pose. • Finally, relax your hands and return to the full Child’s Pose. • Do not lift your head up straight away. Rest for at least a minute. • Relax in the Corpse Pose before continuing.